Dramatic design and very classy. Adds such a great focal point to the room. I was delighted to find such a unique product at such a reasonable price. The chain measures 39.4 inches long. 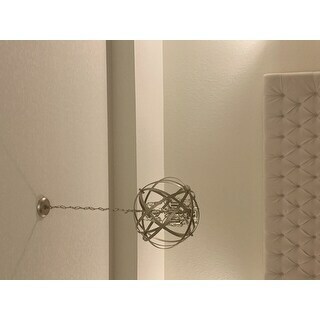 The light fixture is beautiful. It adds so much character to my house. I put it in my foyer above the stair case . The chain can be adjusted also the copper parts around the chandelier can be moved to suit your preference. You need to put in the soft light bulbs ( Mine have a yellow strip inside )which makes the copper part stand out. 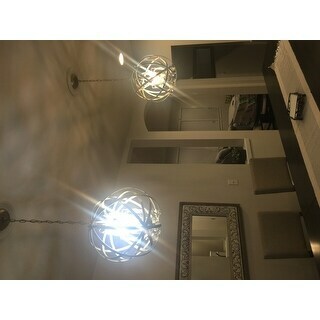 The other reviews say it is more silver and that is because the bulbs are not the soft white bulbs ( got them at Walmart ) The light gives out an abundance of light. We turn it on even when we don't actually need it but just because we love the sharp look . The ficture looks just like the picture and is not to to big and not small. A perfect size! 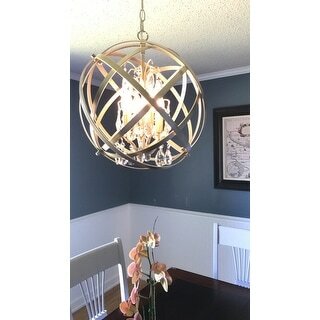 My husband and I really like this fixture which we have installed over our kitchen table. Our ceilings are 8 ft, so we suspended the fixture 8 chain links' down so that it is suspended at the appropriate number of inches above the tabletop. We are using 4 LED candelabra, 60 W. The fixture puts out a lot of light, and the reflections from the crystals are very pretty. This was a straightforward install which we did ourselves. My only criticism is that several of the prongs for the crystals to hang from are crooked. I am hesitant to try and bend these with pliers, because the metal is very rigid and I'm afraid I would snap the prongs off if I try. The style of this fixture is a real change from our older and smaller pendant light. I'm very happy that I "bit the bullet" and upgraded to a fixture with bling. It certainly "classes up our act" in the kitchen!! We like the Antique Copper finish. 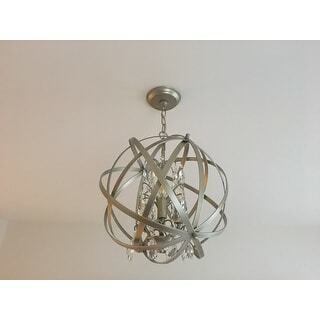 Originally bought this fixture for my dining room but it was too small. We added it to our foyer and it is perfect! 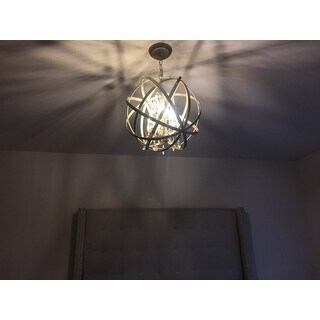 Great quality, beautiful design, gives off great light! We receive tons of compliments on it! I am verify satisfied with the purchase. It is very beautiful in my dining room. I just wish it was about 24-27 inches wide. Overall, this is a great buy for the money! 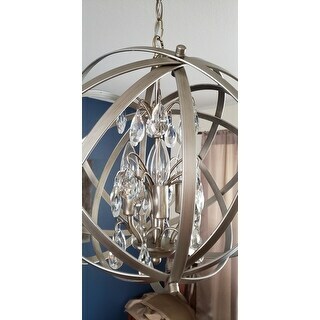 This chandelier is absolutely gorgeous and an amazing price! I just remodeled my dining room and couldn’t wait for this to come back into stock and get it ordered. 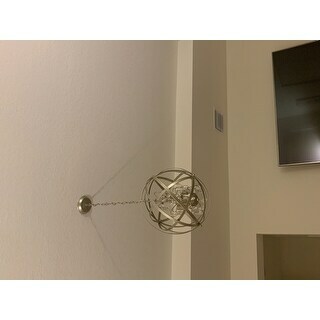 I have a globe/map/travel theme throughout the house and this globe orb chandelier ties everything together perfectly! 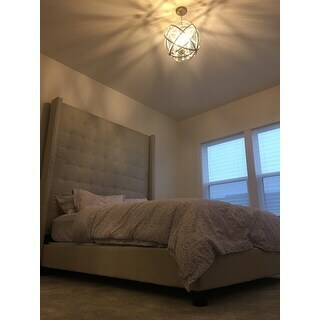 I’m grateful I have it on a dimmer switch or it would be really bright, so I definitely recommend using a dimmer switch if you want to create a nice ambiance. It was very easy for my engineer boyfriend to install and everything was packaged safely and properly. I would 100% recommend! 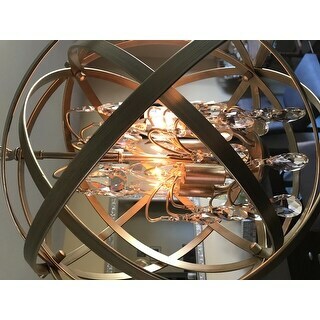 The Benita Antique Copper 4-light Metal Globe Chandelier is so cute. It was a bit smaller then I had imagined, but it works! The color is true to the photo. Very easy to install. This chandelier color is not antique copper. The color is more antique silver. But, it is a good looking light fixture. So, I will have to use in on a different project. This item is gorgeous, easy to assemble and really makes a statement. Although it is advertised as antique copper, it reads as antique silver and is a stunning accent piece. 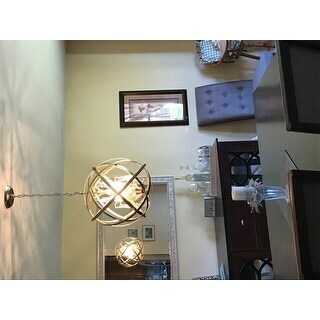 I installed this fixture in my dining room, which has 8' ceilings and it is perfectly sized. Benita Antique Copper 4-light Metal Globe Crystal Chandelier. Shipped within the time frame issued at checkout. Arrived from carrier ontime. Thanks! 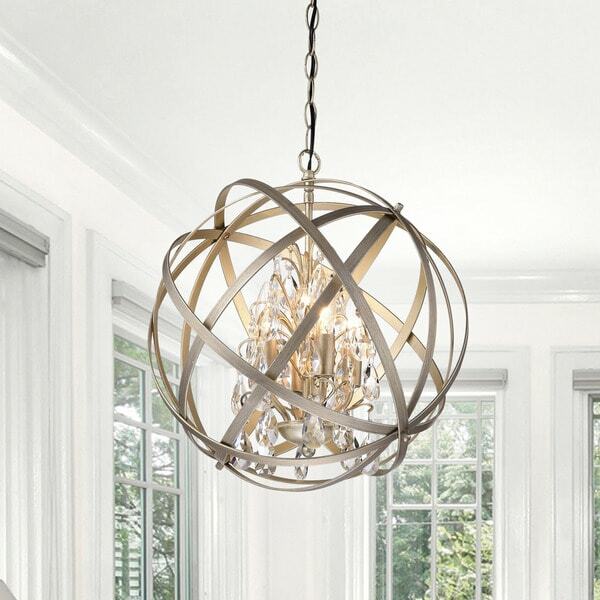 Love these Orb Chandeliers! 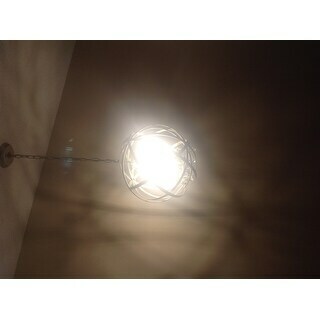 I bought two of them since we have two light fixtures in our dining room and they look stunning! We had to buy bigger medallian frames for the fixture because the ones that came with them were too small for ours. We use a dimmer switch to adjust the lighting per occasion. Must Buy!! There isn’t one thing I dislike about this chandelier. Deliver was speedy. Packaging was perfect. Easy to hang. Contemporary. So pretty. The pieces of the sphere are adjustable, giving it the ability to look like a different piece of you choose. It’s pretty heavy, so hanging is a 2 person job. It’s well worth the small amount of money it cost me (I’d even pay more for it). Beautiful light fixture! 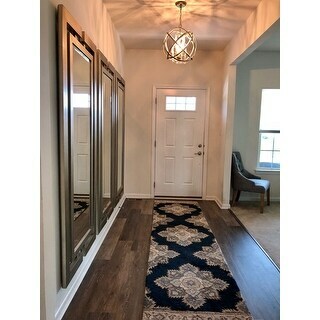 We added this to a dark entryway and it made a huge difference. The crystals hanging down give it extra glam. We receive many compliments. This is one of the most beautiful chandeliers that I have ever seen. It is so unique. The copper color is exactly as pictured. It really has become the centerpiece of the room. The installation was surprisingly very easy considered how complicated the design looks. Just so so so B e a u t i f u l ! ! ! Showed up faster than I thought it would. 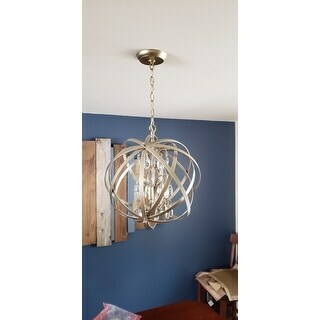 Really pretty color, not too copper, more of a brushed nickel feel, which matches my decor really well.Easy to assemble, you can position the rings how ever you like. I took the small part of the crystal off and just used the teardrop, I think it looks more modern that way. I took off a star because there were knicks on some of the rings but I didn't bother me enough to send it back. 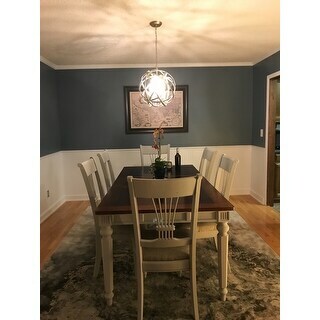 At first I was really nervous about what the color would be of this chandelier from some of the reviews but when I received it I was in love it’s more of a nickel color chromeish I love my beautiful chandelier! It’s better then what I expected, very satisfied! 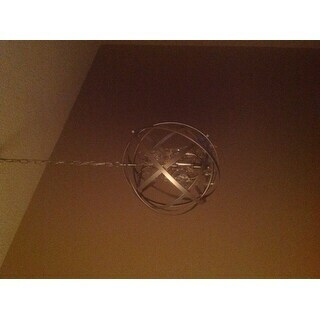 Ordered this chandelier. Came in on time. It's a little smaller than I thought but it's good quality. It's heavy, very solid. Recommend it highly. Elegant style. Looks perfect on 10 ft ceilings. I was thrilled to see in person how well it would go in our new bath remodel! Beautiful, as expected. Will be installed in foyer of my newly purchased home. 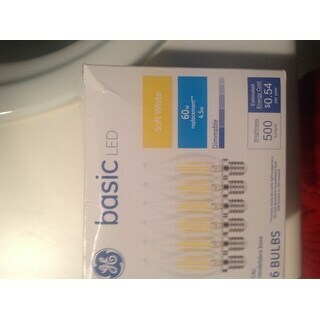 I purchased two of these lights. I absolutely love them. everyone compliments these lights. they really are stunning. Great product easy to assemble and looks amazing. Color was spot on, and looks AMAZING in any room. Highly recommended! So pretty! 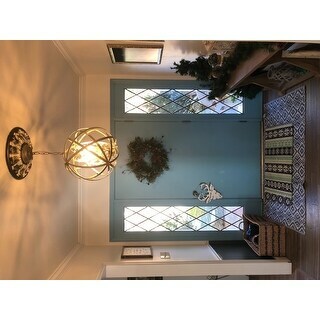 My front door has dated brass leading but this champagne ish color is the perfect, subtle tone to trick your eye into forgetting about the brass on the door! It's not huge but the light is softer now and I love that! "Do you have this in a plug in pendent lamp"
No, this is available to be hardwired only. "Would this look good in the same room with a traditional gold, lots of crystal, glamorous type of chandelier?" Yes, this would look good. Hope this will help. The color is like a pewter. So it’s a mix between brushed nickel and brass. Beautiful light fixture. I get tons of compliments on it. It could go either way with the color. Soft antique gold with a hint of silver. I love it. "Is this fixture dimmable ?" It will be dimmable if you install a dimmer switch. "How would one go about extending the cable and chain? Is there a maximum extension length? 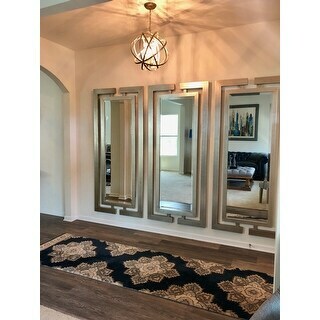 I need for large 18’ wall to sit 8’ so I would need 10’ approx. Can this be accomplished?" There is no maximum extension length. 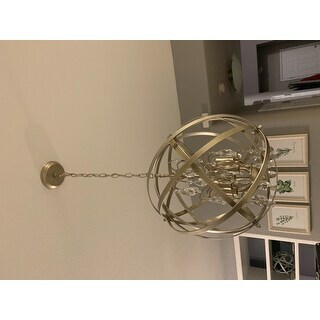 "Would this light look funny with black iron decor hanging on the wall? Or would the black be better? I just saw the black." In my opinion the black would look better. I hope it helps. This light looks good with black iron décor hanging on the wall. The black version looks better. "Is the chain adjustable to make it shorter?" "Yes, the chain is adjustable to make it shorter. Here are the steps: Take out the buckle and screw collarloop from the original chain. Adjust the chain to the length you need, take apart the chain using a pair of pliers or other tools. Remove the extra links. Connect the buckle with chain and screw collarloop together." "I love this light, but don't like the crystals. 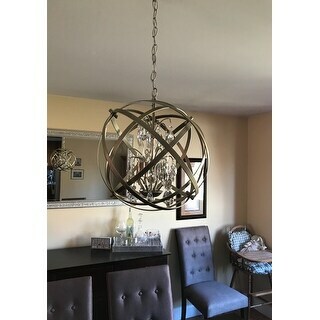 Can the crystals be easily removed / left off of this chandelier?" Yes, the crystals can be easily removed. If you don't like the crystals, you do not need to hang them from the chandelier.